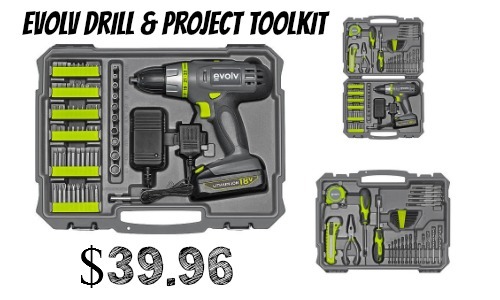 Sears is offering the 107-Piece Evolv 18V Cordless Lithium Drill and Project Toolkit on sale for $39.96! This set is regularly $139.99 so this is a huge savings! This would be a great Father’s Day present and includes items such as a magnetic bit holder, utility knife, 10′ tape measure, long nose pliers, and much more. Grab it while available! Choose FREE in-store pick up to avoid shipping costs.